Glam-rock, goth, neo-punk, evil schoolgirls, searing guitars and wailing vocals, rolled into one big dragonball. We're talking about the ROCK side of Japanese pop culture. It's more than your Yamaha guitar. It's bigger than SushiKing and hipper than HelloKitty. No oldman Kitaro, girly pop Kiroro, or girlyboy Rain (cuz he's korean). We're talking about very fierce SUPER UNDERGROUND japanes-ish bands... Armed with crazy outfits, chains, studs, piercing, huge hair, and bazookas worth of eyeliner. Here is a picture taken the night I first discovered them in some underground J-HOLE in serdang. they are dressed in excess to playing the most popular J-ROCK hits! heck I dont kno the names but they are really J, and coming your way. only to be kept in control by Mayumi, who will be hosting the entire event in Japanese. 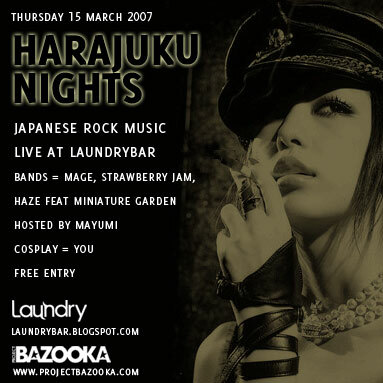 Laundrybar will become an underground tokyo J-hole overnight. Miss this, and you'd better hara-kiri.